SHOW & TELL MAGAZINE 2018 I I-CONNECT007 69 Speaking of self-driving cars, those in the LED world, including companies making RF boards, are doing very well; that business con- tinues to thrive, as does the medical device business. Companies that have focused on those industries expect a bright future. This year's show was also a living example of the globalization New York Times colum- nist Thomas Friedman discusses in his best- selling book, "The World is Flat." There were booths from many countries at the show—not just European, but Asian companies as well. Yes, the Chinese were there in force and doing well. Gone were the tiny booths with a few out-of-place Asians not quite knowing how to handle this very American show. These booths were manned by both Chinese and American representatives who understood and spoke English very well. They knew what they were talking about and they were here to do busi- ness. The encouraging thing about it was that they were working with American companies in partnership and cooperation. They were not our enemy, but potential partners trying to find the best ways to work together to serve the PCB market. 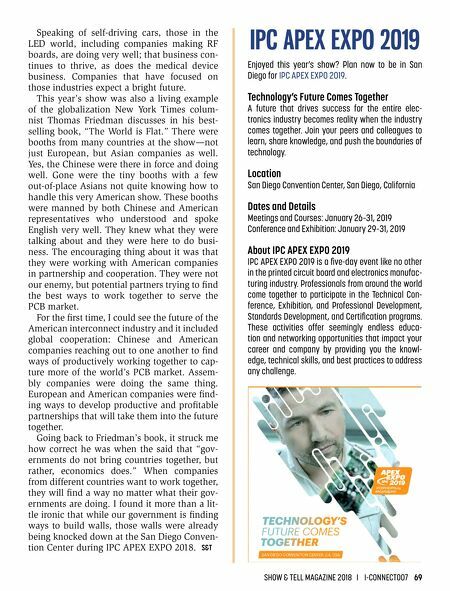 For the first time, I could see the future of the American interconnect industry and it included global cooperation: Chinese and American companies reaching out to one another to find ways of productively working together to cap- ture more of the world's PCB market. Assem- bly companies were doing the same thing. European and American companies were find- ing ways to develop productive and profitable partnerships that will take them into the future together. Going back to Friedman's book, it struck me how correct he was when the said that "gov- ernments do not bring countries together, but rather, economics does." When companies from different countries want to work together, they will find a way no matter what their gov- ernments are doing. I found it more than a lit- tle ironic that while our government is finding ways to build walls, those walls were already being knocked down at the San Diego Conven- tion Center during IPC APEX EXPO 2018. 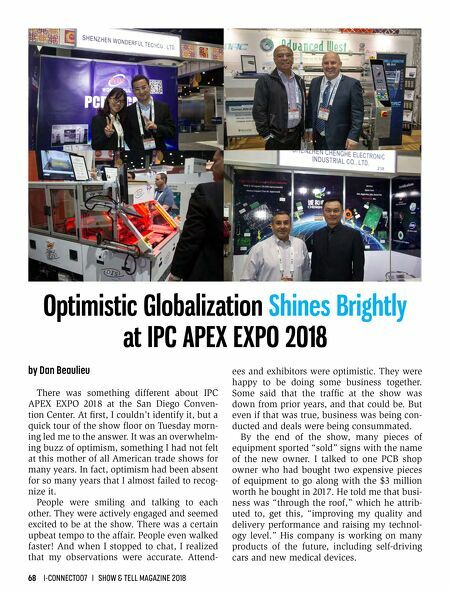 S&T IPC APEX EXPO 2019 Enjoyed this year's show? Plan now to be in San Diego for IPC APEX EXPO 2019. Technology's Future Comes Together A future that drives success for the entire elec- tronics industry becomes reality when the industry comes together. Join your peers and colleagues to learn, share knowledge, and push the boundaries of technology. Location San Diego Convention Center, San Diego, California Dates and Details Meetings and Courses: January 26–31, 2019 Conference and Exhibition: January 29–31, 2019 About IPC APEX EXPO 2019 IPC APEX EXPO 2019 is a five-day event like no other in the printed circuit board and electronics manufac- turing industry. Professionals from around the world come together to participate in the Technical Con- ference, Exhibition, and Professional Development, Standards Development, and Certification programs. These activities offer seemingly endless educa- tion and networking opportunities that impact your career and company by providing you the knowl- edge, technical skills, and best practices to address any challenge.